Hi, I'm Jamie and I'm here to show you our new anti-siphoning tank. Basically, what this does is it replaces this hose that used to connect to the top of the three-way valve to the bottom of the sink and that was for your fresh water flush for your Fleets. This anti-siphon tank greatly reduced the possibility of siphoning from the sink into the tank. This product doesn't increase the price and comes standard on all our units beginning February 2018. If you'd like any more information about this product or any other products that we carry visit out website and thank you for watching. Designed to improve your Fleet units, this anti-siphoning tank helps increase the efficiency of your fresh water flush tanks. Now it comes standard on every Fleet unit, without a price increase, to keep your units working effortlessly! 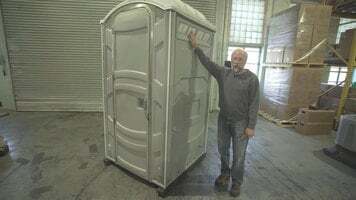 Check out this top-end PolyJohn Fleet portable restroom to add to your work area or event! Pair it with a fresh water flush Fleet unit to provide a nice hand-washing station for optimal sanitation. Provide easy access to hand washing stations with the use of a PolyJohn Fleet hand sink. With hands-free operation, you can easily improve the cleanliness of your area or event with the addition of this sink.